If your consultant says you have peripheral vertigo, you’ve got a lot of company. Peripheral Vertigo is usually more severe than central vertigo. In most cases peripheral vertigo is caused by a problem in the inner ear, causing imbalance in your ear. BPPV is the result of disorder in the inner ear and causes a sudden sensation of spinning that come and go. It does not indicate any serious health problem. Symptoms: Number of activities can cause BPPV. However, majority of symptoms occur when there is a change in position of our head along with unusual eye movements. Cause: The inner ear has tubes filled with fluid. When we move, the fluid moves along. The canals are very sensitive to any such kind of movement of the fluid. This sensation tells your brain the situation of our body which helps to keep our balance. Benign paroxysmal positional vertigo occurs when some of the calcium carbonate crystals break free and floats in the tube, they interfere with usual fluid movement causing inner ear to send false signals to the brain, leading to vertigo. Treatment: Your health care provider may perform a procedure called Epley’s maneuver can help relieve vertigo. It helps to move the small piece of calcium which is floating inside your inner ear. To keep the symptoms of vertigo getting worse, avoid the positions that cause it. Brandt-Daroff exercises can be done to help vertigo as it helps your brain get used to the abnormal balance signals. Avoid sleeping on the side on which the ear is causing problems. In the morning, get up slowly and sit on the edge for some time before standing. Vestibular neuronitis, which can occur in any age group, is one of the most common causes of vertigo. It is an acute, sustained dysfunction resulting from an infection that inflames the nerves connecting the ear to the brain. This inflammation interrupts the transmission of sensory messages from ear to the brain and vertigo occurs. 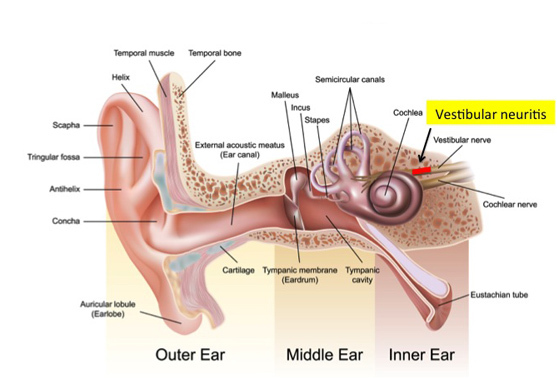 Vestibular neuronitis causes dizziness that occurs suddenly and may last for few weeks. Symptoms: Mild dizziness or violent spinning can be symptoms of vestibular neuronitis. Symptoms also include difficulty with vision, balance difficulty, nausea, vomiting and impaired concentration. Vestibular neuronitis symptoms usually come on suddenly and person may even have trouble standing up or walking. Cause: Vestibular neuronitis is thought to be caused by viral infection which could be related to systemic viral infection. Some infections associated with vestibular neuronitis include mumps, herpes virus, hepatitis and measles. Treatment: Severe vestibular neuronitis is treated with medical help to restrain dizziness and nausea. If a person is vomiting and has become dehydrated, antibiotics and antiviral drugs may be prescribed. With immediate treatment, vestibular neuronitis usually does not cause any permanent damage. Home treatment: If you are advised to exercise by your specialist, it’s important to continue exercise for as long as you are advised. You should keep moving, even if lying or sitting is more comfortable. The purpose is to return to your usual activities. Meniere’s disease is a chronic and progressive condition that affects the flow of fluids in the inner ear. It describes a set of symptoms such as hearing loss and sensation in the ear. The episodes usually last from 20 minutes to 4 hours. The disease usually affects only one ear. Symptoms: Symptoms may vary with people. It may start with hearing loss, eventually leading to dizziness and unpredictable attacks of spinning sensation. During attacks people are very disabled and headaches may follow. There could also be hearing loss, tinnitus and feeling of fullness in the affected ear. Cause: What causes Meniere’s disease is unknown. There are number of factors thought to be involved such as increased pressure in the endolymphatic sac, improper fluid drainage because of anatomic abnormality or allergic factors that can damage the inner ear. Treatment: There is no cure for Meniere’s disease but there are various treatments that can help reduce the frequency and severity of the vertigo episodes. Some treatments aim at minimizing the severity when it is happening while some aim at reduction of severity and number of attacks in the long term. Medications can be used to reduce nausea and vertigo attacks. Home Treatment: Some self-care tactics can help reduce the attacks. Take rest during and after vertigo attacks and do not rush to your usual activities. Avoid driving vehicle if you have frequent episodes since it can lead to a serious injury. Lie down whenever you feel dizzy and avoid things that make the Meniere’s disease symptoms worse such as reading or watching TV.